October 4, 2018 October 4, 2018 - by Lisa Wingerter - 19 Comments. Preschool at home is going strong! In fact, I am super late on this post because we have been so hard at work. 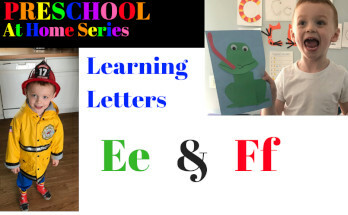 I have shared lesson plans for the letter A, letter B, letter C, and letter D. Today I am going to share what we have planned for learning the letters E and F. This post contains the resources, activities, and books I have gotten together for teaching my preschooler the letters E and F.
This post will focus on learning the letters E and F.
There are tons and tons of resources online, both Free and Paid. You can follow my preschool board on Pinterest, as I have been saving tons of ideas and resources. Click here to FOLLOW. I recommend visiting your local library’s children’s section to stock up on some books. My favorite part about teaching preschool at home is that you can tailor your plans specifically to your child and their interests. 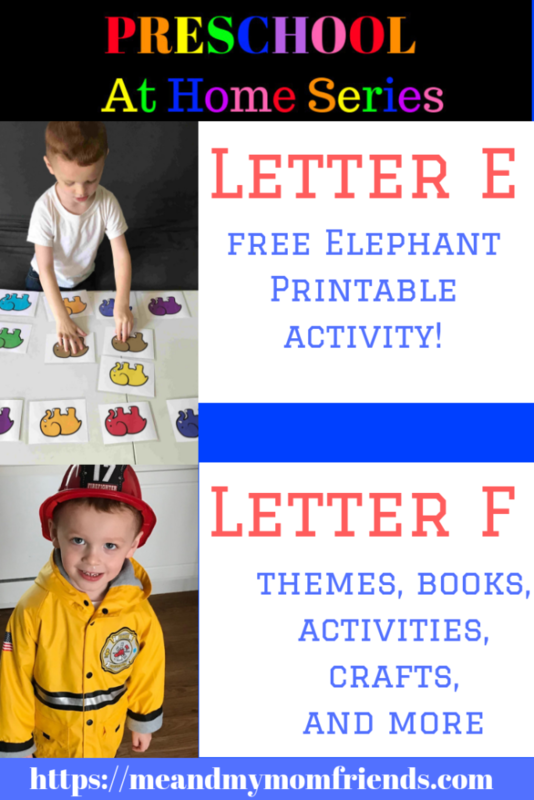 For learning the letters E and F, we will be using the following themes: Elephants, Eggs, Fire Fighters (my son’s personal favorite), and Frogs. I will be spending a couple of days initially on each letter of the alphabet. Therefore, I have chosen a couple of books. 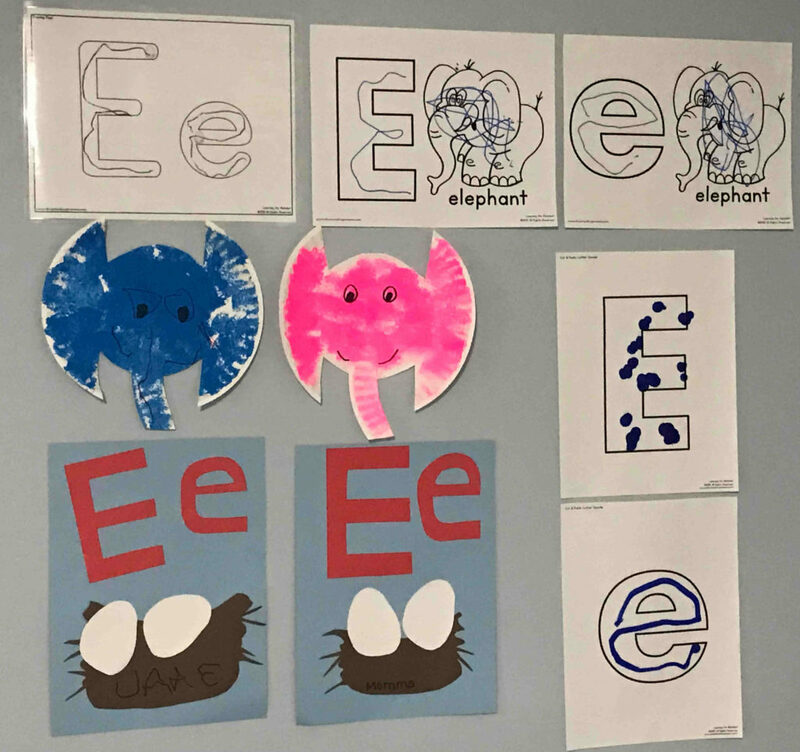 I have also included fun little craft projects to go with these books and help with learning the letters E & F.
For learning the letter E, we chose the book Albert the Alphabetical Elephant, by Roger Hargreaves. 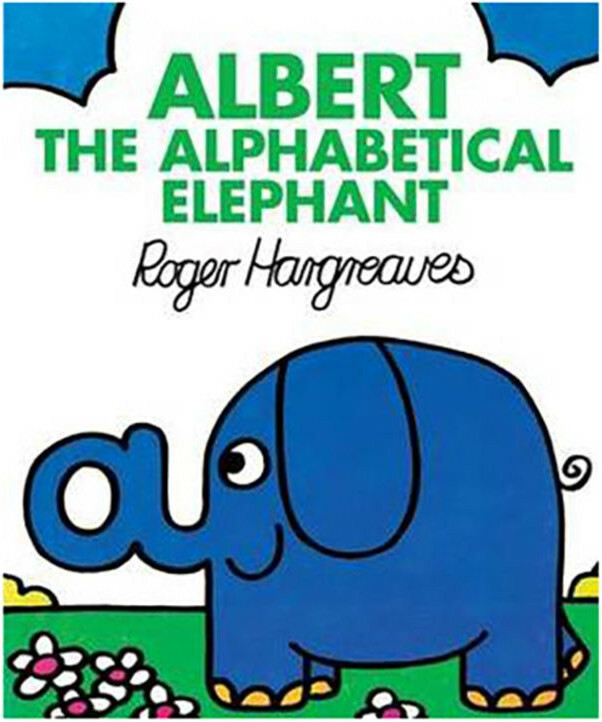 This story is cute, because it also reviews the alphabet as a whole, as Albert shows off the special abilities of his trunk. We made an Elephant craft to go along with this book (see below). In addition, I made Elephant Color cards to do activities with. 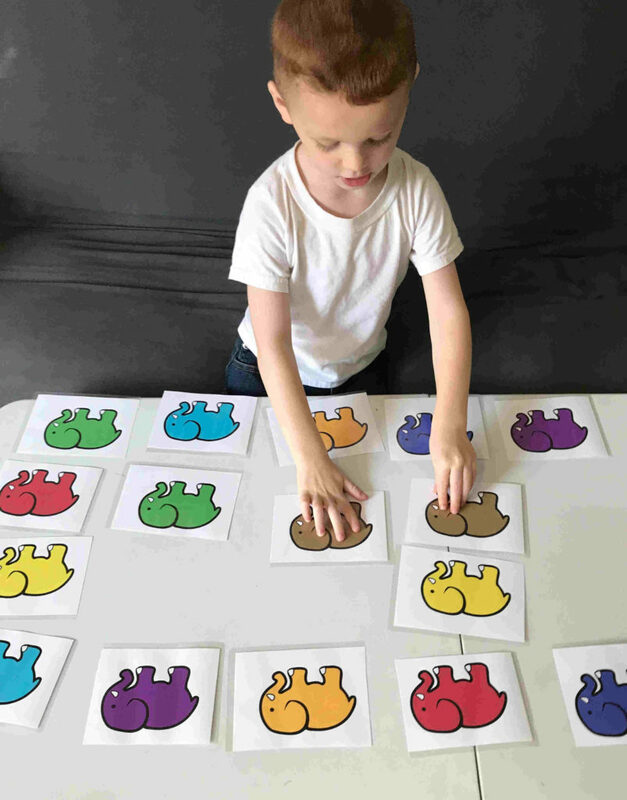 We played a matching game, and an “Elephant Hide and Seek” game, where my son had to search for specific colors of elephants around our house. 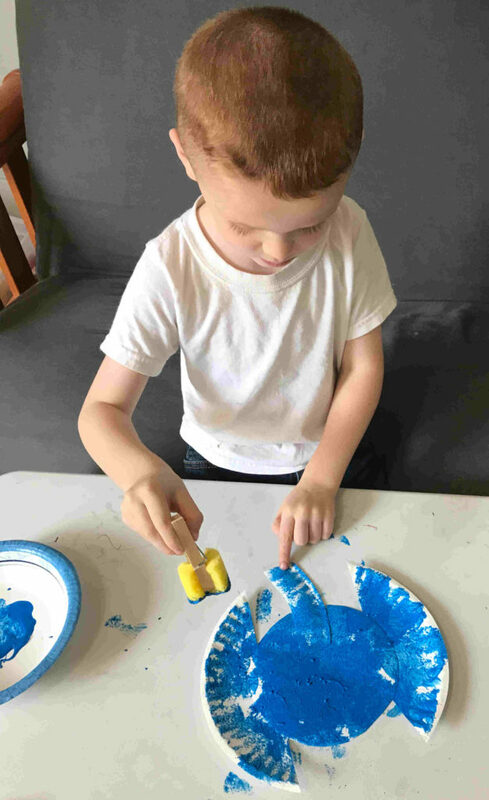 It was a fun activity because it allows my high-energy son to move around while learning his colors. I have included a free printable PDF. Print 2 copies, laminate, and cut, then just have some fun! CLICK THE IMAGE ABOVE FOR YOUR FREE PRINTABLE ELEPHANT COLORS! 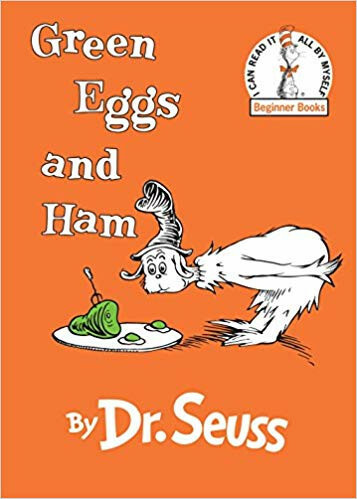 For learning the letter E, I had to go with the Dr. Seuss classic, Green Eggs and Ham. There is a reason this story is a classic. First off, its so much fun to read and listen to. Second, I love the fact that it encourages the reader to try new foods. Toddlers aren’t known traditionally for the adventurous palettes. Lastly, I can’t help but have a soft spot for this book, because this was the first book I ever read on my own as a child. We made a nest with eggs in it for our craft to go with this story (see below). 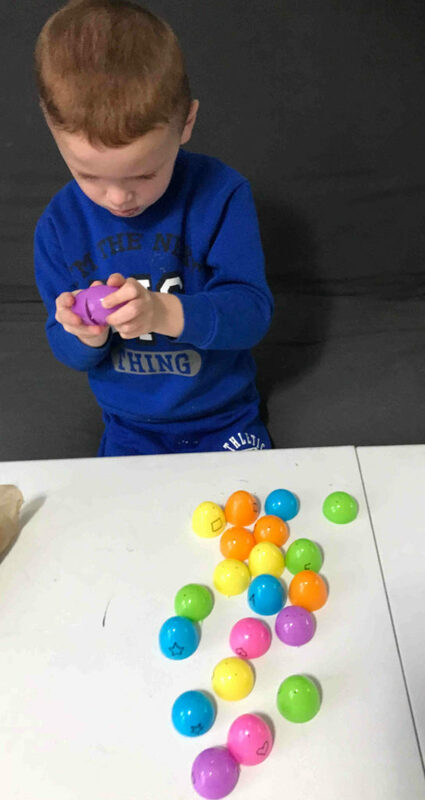 Another activity we did that was a big hit at our “preschool” was our egg matching activity. I used plastic eggs we had left over from Easter, and a magic marker, or sharpie marker. I drew shapes on each half of each egg, and also did Upper and Lower case letters. My son had so much fun matching the top and bottom shapes and each of the letters. It was also a really nice fine motor activity. 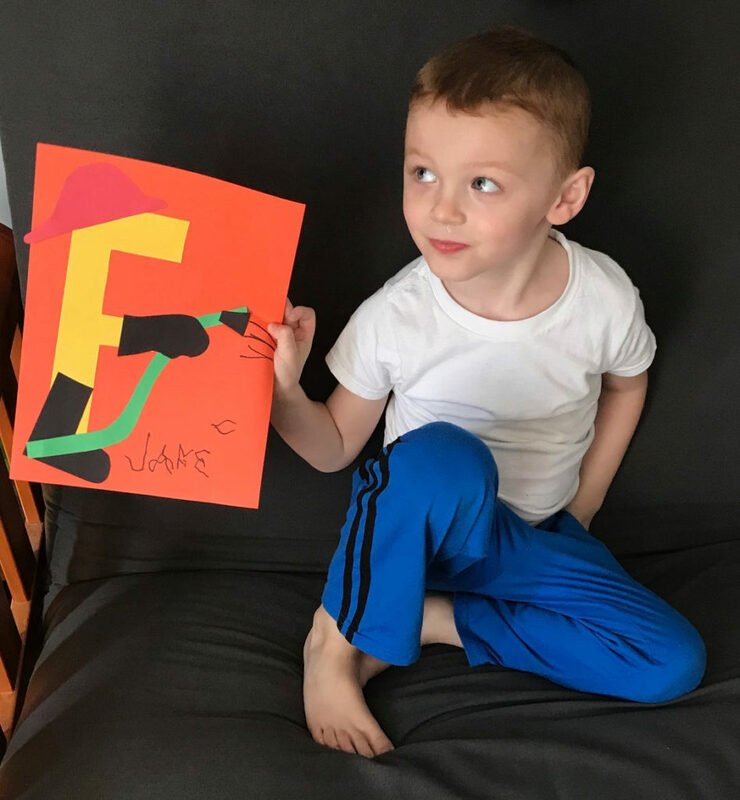 We made the letter F into a fireman. (see below). 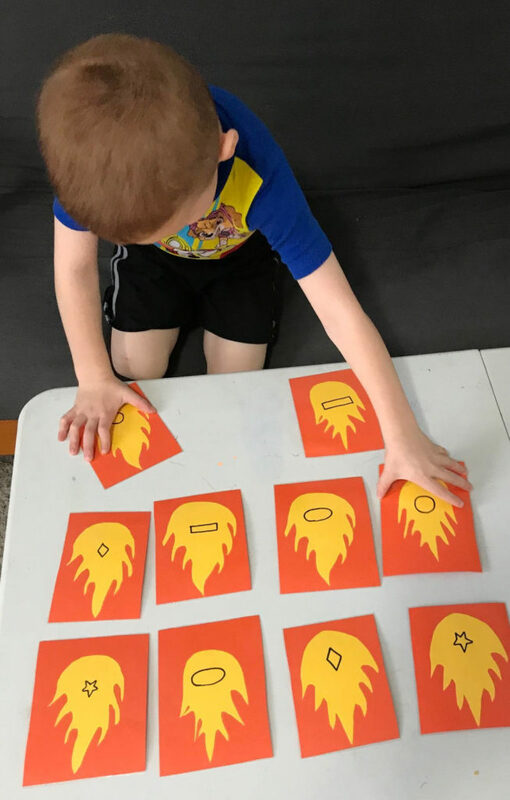 I made fire cards using construction paper and drew shapes on the fires. We did a shape matching game, and a “fire shapes hide and seek” like we did with the elephants. I also highly recommend this fire fighter preschool pack from https://www.freehomeschooldeals.com/. Some of the books I choose are a little more advanced. I am starting to stretch into beginning reader books. We had to make a frog (see below). I usually only have one theme per day, but with this, I saw an opportunity to combine the themes. We spent one day learning about fire fighters. Then we read a story about a frog saving the day. So as a fun gross motor activity, I decided to get creative. We had a very warm fall day here in Michigan, so I went outside and created a story we could interact with. 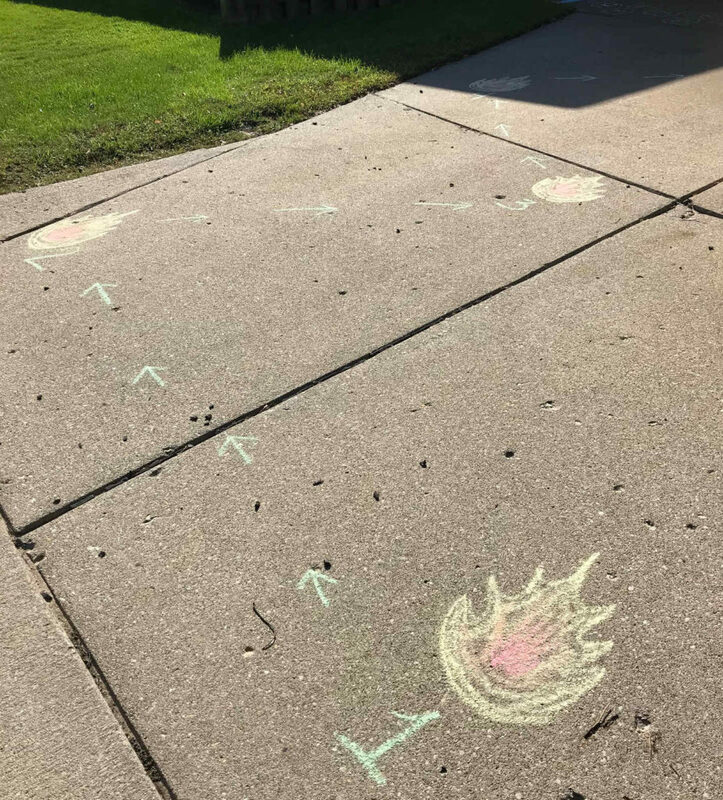 I used sidewalk chalk to draw a maze of “fires” that lead to a frog who was in need of rescuing. The object of the game was for my son to follow the maze and put out the fires to save the frog. Then at the end he had to hopscotch the frog on lily pads back home to his pond. This was a HUGE hit. So much so that we did it multiple times. See the photos below. 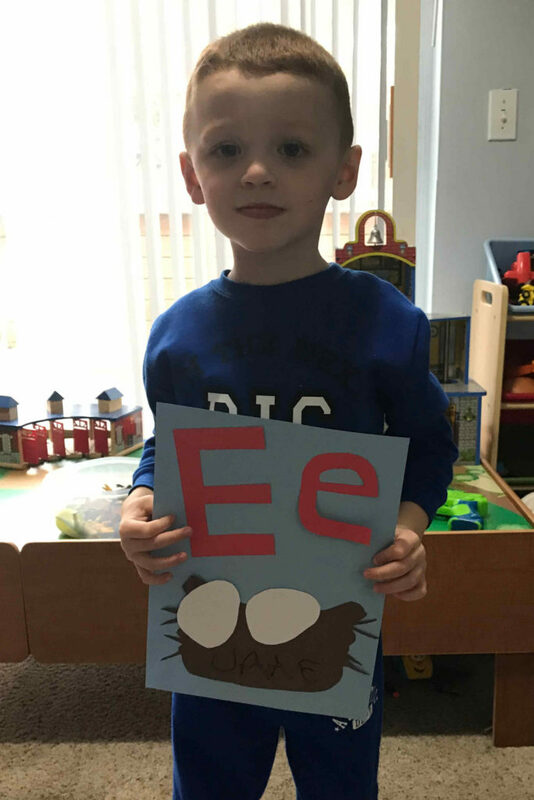 That is how we started learning the letters E and F on our preschool at home journey. Make sure to subscribe or check back weekly for more lesson plans, resources, books, ideas, and free printables. Have fun! 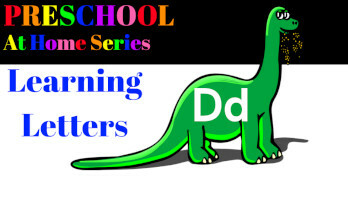 To Learn about Lesson Planning for Preschool at Home, CLICK HERE! For some tips and tricks I have learned so far, CLICK HERE! 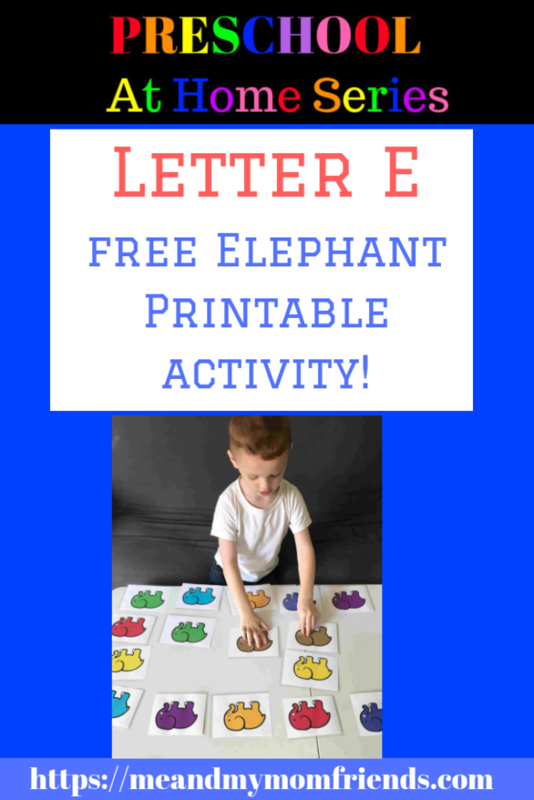 Next Article Learning the Letter G – Free Printable! I love the excitement and enthusiasm on his face! 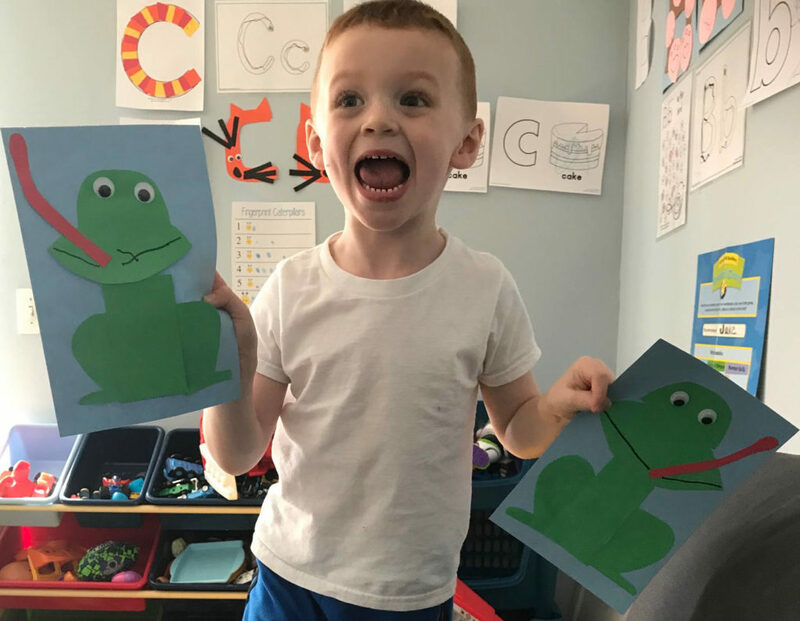 I am a reading specialist, and it makes me happy to see him learning through all of the different modes – especially utilizing art and movement. Great job! Wow! This is an amazing blog, such great ideas! My boys are teens now, but I sure would have loved your blog when they were younger. I was a school teacher and day care teacher many years ago, your blog is probably so helpful to many. I plan to share with a friend who works with 4 year olds at a day care I worked at pt recently. 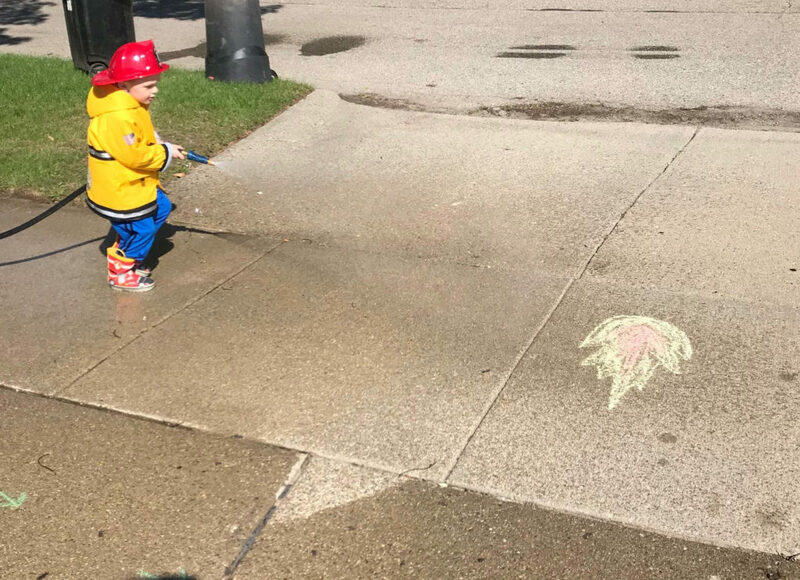 My favorite thing is when your son has on the fireman costume and he’s putting out the chalk ?! So cute! And very creative! This is a great post! I have a preschooler at home and these are some great ideas for her! She loves books and crafts. Thanks! I will be eagerly following for incredible ideas. I hope that my little lady will be an avid reader. Love this blog & the fab pics. This is great! Thank you for the multi-disciplinary ideas and instructions. I can’t wait to try this with my three year old! I love the paper plate elephants and the Firefighter activity. I’m going to try these with my boys. Wow! This is such a creative way to teach kids! My little ones go to daycare but this is something to do at home instead of giving them any type of electronic devise! Oh wow! I LOVE your idea’s and not just for pre-school either. This will help me get my 5 year old ready for Kindergarten next year. He has SPD so is still at home this year but HAS to go to school next year! I love the paper plate elephants! I think we will try our hand at making our own this weekend! Thanks! This is amazing! I love you firefighter letter F’s, but seriously all of your projects are super cute. I’m excited to see what you do next ? 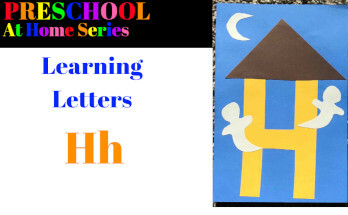 Such cute and creative ideas for learning letters with the kids. Unrelated but related, I love your son’s little fireman costume — so cute! These are such great, creative ideas! I especially love the idea with the eggs and the shapes because you could adapt that to so many different things to help teach your kids and I know my daughter would love it! I need to keep it in mind! I am all about getting kids outside to learn from hands-on fun. The maze and hopscotch course you set up was so cute and looked like a blast! What a fun way to incorporate what you have been learning with outdoor fun! Love this! I love that you focus on one or two letters and I love all the different activities you do with them. I have a three year old and one year old and, in addition, babysit three other three year old boys. 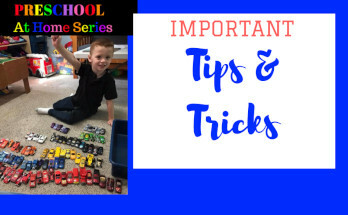 I struggle with finding educational activities for them that they will sit through. They are always down for playdoh, coloring, or other crafts. But I usually struggle when trying to get them to sit for flash cards or books. I will definitely be trying some of these activities. Thanks! I love this! It’s messy and it’s lots of fun….which equates to engagement and active learning for the little ones. I will save these for when my child gets just a little bit older. I think 2-2.5 might be a good age to try. What do you think? Perfect age to start! Just keep the baby wipes or wet wipes handy! Very nice activities that involve a lot of skills. Congratulations!